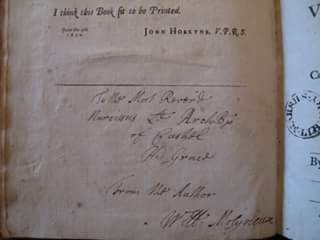 Among the other copies that Molyneux gave away was one sent to John Locke, which triggered a correspondence and a friendship that lasted until Molyneux’s death in 1698. Source of images: Marsh’s Library on Facebook (Creative Commons). how acceptable I thought it might be to the Learned World, upon a second edition of Mr. Newton’s Phil. Nat. Princ. Math. to receive some further Elucidations upon those sublime thoughts therein containd. I do not know how far Mr Newton himself may be inclinable to undertake such a task, I am apt to think he may not conceive it worth his While, but may rather leave it to others to build on that Foundation that he has laid. If therefore by your Advice and Incouragement any of the Curious Witts of Lond[on] could be put upon such an undertaking, I should think it very wel worth his Pains. We have in some Measure already an Instance of the Relish Many would have of such a Work in what Mr Whiston has Publishd in his New-Theory. Which you know has had an abundance of Mr Newtons doctrine in it, and has invited a Multitude of Readers that would hardly ever have lookd into Mr Newtons own Work, By reason of the Difficulty of the One, and the Familiarity of the Other. From a letter dated November 13, 1697, from William Molyneux (born 17th April 1656) to Hans Sloane (born 16th April 1660). Sloane MS 4036, fol. 367, as quoted in Science and the Shape of Orthodoxy: Intellectual Change in Late Seventeenth Century Britain by Michael Hunter. 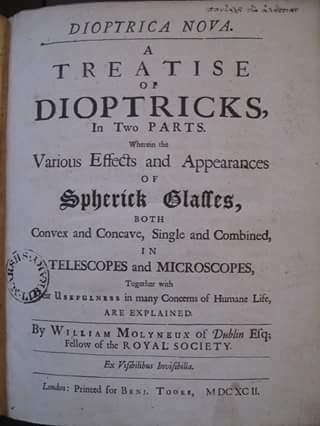 This letter is characteristic of the roles both men played: Molyneux (one of the few who could appreciate Newton’s Principia without assistance, per Hunter) seeking to disseminate Newtonian physics more widely, and seeking the support of Sloane, editor of the Philosophical Transactions and centre of a network of those “witts” interested in natural philosophy. The book Molyneux recommended emulating is A New Theory of the Earth. At the time of writing the spread, let alone the widespread acceptance, of Newton’s physics had only just begun. I am now to address a free people. Ages have passed away , and this is the first moment in which you could be distinguished by that appelation. I have spoken on the subject of your liberty so often, that I have nothing to add, and have only to admire by what heaven-directed steps you have proceeded, until the whole faculty of the nation is braced up to the act of her own deliverance. I found Ireland on her knees – I watched over her with an eternal solicitude, and have traced her progress from injuries to arms, and from arms to Liberty. Spirit of Swift – spirit of Molyneaux – your genius has prevailed – Ireland is now a nation – in that new character I hail her; and bowing to her august presence, I say, Esto perpetua. Printed version of the speech of Henry Grattan, 16th April 1782 in the event of the Irish Parliament gaining legislative independence. (It’s likely the invocation of William Molyneux and Jonathan Swift was not in the original spoken version.) Eighteen years later “Grattan’s Parliament” ended with the Act of Union. Alternatively try this readable account by an optician.